The Vipukirves LeverAxe is splitting axe that is long overdue. Humans have been using axes for a very long time, in fact, recently scientists discovered the earliest known axe in Australia, created up to 49,000 years ago. Yes, we’ve been splitting wood for ages. If there is one way to make someone appear more manly in a movie, it’s getting them to split logs with a big axe. In fact, it’s probably motivated you to go outside and spend hours chopping firewood after the credits finished rolling in the past. There is one big difference between movies and real life. The kind of axe they use looks like it’s recently been dug up from an archeological site, whereas the axes on offer today are a hundred times better. The Vipukirves LeverAxe is the perfect example of the best currently on offer, but there is one question we need to ask ourselves first : What are the advantages of using an axe? Before we get into the heart of this article, watch this video, which will give you a great overview of the Vipukires Leveraxe vs a traditional ax. Made from very hard stainless steel (Duplex) — twice as strong as austenitics. The axes you can buy these days are technologically superior to ancient relics, but they’re still just basic axes. You drive them into the wood using brute force and it will split in half. Not only will you have to pay for your log splitter, but you’ll also need to pay to maintain it. Then you have the gas you’ll need to power it, or if you buy an electric one it will need to be charged up. When you buy a great axe you know there will be no hidden costs, and the only other thing you’ll lose are the extra pounds of fat you’re carrying. Everyone has seen Friday the 13th, and thinking about it might still give you chills. Do you think you’d feel the same way about the movie if Jason was dragging a log splitter around with him? They might have wheels making it easy to maneuver around your garden, but it’s a lot easier carrying an axe to the place where you’re going to split your wood. The pieces can then be thrown inside a basic wheelbarrow and wheeled back to your home. They say splitting wood with an axe could hurt your back, but so could taking your wood splitter everywhere you go. This ties in with a few other points we’ve touched on today, but it’s important to highlight how easy it will be to start chopping wood when using an axe. As soon as you’ve picked it up you’ll be ready to go. If you’re using an electric wood splitter you’ll always need to be close to a socket and you better not misplace your extension cord. Gas-powered wood splitters will require you to have spare gas handy at all times, and you might need to top up the oil before you’ll be ready to go too. Although they say using one to chop wood is quicker, it’s only once you’re up and running. As you will already know, there are different types of wood you’ll need to deal with depending on the tree. There is no denying a wood splitter will be able to handle any wood you place inside it, but will cheaper machines be able to handle large chunks of hard wood? Even if they are capable of cutting through something like oak, it’s not going to last as long until something goes wrong. As long as you’ve got the power an axe will handle anything all day long, especially one like the Vipukirves Leveraxe. An axe is the perfect tool to use when you want to give a piece of wood a quick trim. The branches you’ll find in your garden will come in all shapes and sizes, so you might need to search for a while until you find stuff you’re able to throw into a log splitter. It doesn’t matter how many extra branches are bursting out of the main branch you plan on splitting with an axe, because you’ll be able to tidy it up in a few seconds. You’ll also be able to attack things too big for your log splitter to handle. Requires less force than a traditional axe. Unless you live in the middle of the Arctic Circle, it’s not like you’ll need a huge amount of wooden logs to keep you warm during winter. If you’re a healthy individual you will be more than capable of splitting wood with something as magnificent as a Vipukirves LeverAxe, so a wood splitting machine will only get in your way unless you have a large amount of storage space available. It’s not the biggest piece of machinery you’ll ever see in your life, but how much space do you think you’ll need to store an axe? The Vipukirves LeverAxe has started to take the world by storm, and it’s now officially the axe everyone needs in their collection. It was invented by a retired air controller from Finland, and as soon as word spread it wasn’t long before videos were popping up all over the internet displaying its amazing powers. The first thing you’ll notice about the axe head is where it’s sitting. It sits on the side of the axe, which alters its center of gravity. When you strike the wood with the axe head you’ve supposed to relax your grip a little, so once it enters the wood it will automatically start turning to the side. It forces the wood apart as opposed to a traditional axe head, which means it will split even if you don’t put a lot of force into it, and there is much less chance of you needing to strike the wood a second or third time. It takes very little time to learn how to take advantage of the offset center of gravity. Ultra lightweight. Easy to swing with maximum force. We’ve already talked about the limits you’ll have on the size of logs you can use when you own a log splitter. The same kind of thing applies when you’re using a normal axe too, because you’ll always need to split the log through the center first. Thanks to the unique design of the Vipukirves LeverAxe you’ll never be forced to split wood in a certain way again. You could start from the outside of the log where it’s easier to cut before making your way inside, which is impossible to do with any other axe while staying perfectly safe at the same time. Speaking of safety, there are a couple of things about the Vipukirves LeverAxe designed to keep you out of harm’s way. The length of the axe is just over 35 inches, so you’ll never be anywhere near the wood when the axe head strikes. The Leveraxe 1 is just under 7 pounds and the LeverAxe 2 is under 5 pounds, so they’re not even heavy. The other big safety feature is the fact your Vipukirves LeverAxe will rest nicely on top of the logs you’re splitting, so there is no way for it to bounce in a random direction after you’ve hit the log with full force. This also allows you to use your axe on any steady surface, plus it won’t wear down your axe block. Smart design will save your back when splitting firewood. Think about how thin a traditional axe head is. If it wasn’t thin, it would be almost impossible to split wood. This also means unless you split the wood with one strike it’s far too easy for it to get stuck. You’ll then have to spend a lot of time pushing and pulling it from side to side to release it, which will never happen when using a Vipukirves LeverAxe. Although it might not sound like a big deal, you’ll save a huge amount of time if you have a lot of wood to split. The end result means your Leveraxe will allow you to split wood so fast you’ll be able to keep up with a log splitter, especially when you take into account things like the time it would take you to set one up. A big part of the reason why the Vipukirves LeverAxe is so comfortable is because you don’t need to use as much force when you’re splitting wood. The reason traditional axes aren’t always favored is due to the manual labor involved. The lever action and rotational spin will save you lots of energy. The birch and ash used to construct the handle will also help to absorb vibrations, so your hands won’t hurt when you strike hard logs with the axe. To top it off, the handle is also designed to keep your hands as warm as possible during the cold weather when you’re more likely to be splitting firewood. Split multiple pieces of wood at one time. Less strain on your back. Total weight w/concrete: 185 lbs. Shipping package: (20″ x 17″ x 12″) : 28 lbs. The Vipukirves LeverAxemight be the cool kid on the block at the moment, but there are obviously some other excellent axes out there. They come from two companies in particular, and we’re going to give you a rundown of their offerings today while highlighting the top features. They are traditional axes compared to the unique design of the LeverAxe, but if you’re old school these are your best bet. The most popular splitting axe on the market today. Perfect for taller users splitting medium-to-large-sized logs. Fantastic balance and power-to-weight ratio creates a faster swing speed and increased power. Innovative bevel convex blade geometry increases power and makes the blade easier to remove from wood. Fiskars proprietary blade-grinding technique creates a sharp edge for improved contact and clean cuts. Hardened forged steel blade stays sharp longer than traditional axes. Reduced-friction blade coating slices through wood and minimizes the head from getting stuck. Insert-molded head will never loosen and prevents overstrike breakage. Shock-absorbing FiberComp handle. Lightweight and stronger than steel. Textured non-slip grip makes it more comfortable to hold and easier to use. Designed in Billnäs, Finland, building. Includes a sheath that helps protect the blade and the user. Ideal for splitting medium-to-large sized logs. Ideal for medium to large logs. Best for splitting small-to-medium sized logs. *Same features as previous Fiskar splitting axes. The only difference is the length and weight. Designed for easy one-handed use when splitting small logs. Ideal to be used as a secondary axe for fast jobs. Deep wedge combined with the punishing weight delivers a powerful striking force. Best for splitting tree trunks, large logs, and heavy firewood. Insulation sleeve captures initial strike shock before it can reach your hand. Designed to split wood (splitting face) or drive wedges and stakes (driving face). You might have already decided an axe is the right choice for you, but it would be foolish to dismiss log splitters. They do have their own unique advantages, which you might find suits your needs a lot more. The only way you’ll be able to find out is by comparing the two, so let’s look at some of the main advantages a log splitter will offer you. Afterwards we’ll take a look at some of the more popular models on the market and the ways in which they’re special. For large volumes of log splitting, we recommend using a log splitter. As with any piece of machinery, once you’ve read the instruction manual it doesn’t take you long to figure out how to use something. Log splitters aren’t a complicated piece of equipment, so as soon as you’ve used it to chop up wood you’ll quickly become an expert. When you’re using an axe you’ll always be held back by your ability to strike the log every time, but a log splitter will do all of the work for you. They also happen to be much safer to use if you follow the instructions carefully and wear the correct safety equipment. An axe can’t compete with a log splitter. It’s highly unlikely you’ll need an advanced log splitter, because you’ll only want firewood to keep you warm during the cold nights. An average machine will easily be able to split the wood you need to throw inside your fire. Electric ones aren’t exactly huge and they won’t release any toxic fumes, so you’ll even be able to chop the wood inside your garage if there is enough space. Do you want to do things manually when there is a perfectly good alternative available? It would be wrong to say log splitters will always beat an axe when it comes to speed, because under certain conditions it’s not true. If you’re in your home at night and you need to chop up a few pieces of wood it would be much quicker to grab your Vipukirves LeverAxe. It all changes when you need to chop up a large amount of firewood at the same time. Some people prefer to build up a collection of wood ready to be thrown in the fire at a moment’s notice, in which case it will always be faster using a log splitter due to the fatigue you’ll suffer doing everything manually. How often do you think you’ll get hurt placing a log into your splitter? Unless you forget to wear gloves and cut your finger on the wood, it’s not going to happen. When you’re repeatedly striking logs with an axe everything changes, even if you’re using a Vipukirves Leveraxe. Some people will eventually suffer from back trouble, and if there is already an underlying problem it will only get worse. There is no guarantee you’ll get injured using an axe, but it’s always a possibility and something you must take into consideration. How will you stay warm if you’re too injured to chop wood manually? A few years ago you couldn’t have bought a log splitter unless you had a lot of money, but times have now changed. They’ve finally released machines cheap enough for anyone to afford unless they’re looking for a serious piece of equipment. Axes are starting to creep up in price due to the advancements in technology, so sometimes you’ll be able to pick either one up for the same price. They will cost you more money over the long term thanks to a few different factors, but they’re cheap when you grab them off the shelf. There are a huge amount of log splitters on the market right now, so going through all of them would take you forever. It’s going to be a lot less stressful if your life is made a lot easier by narrowing down the choices. Today we’re only going to discuss a select few you’re sure to love, and if you click on them and read the reviews previous customers have left you’ll see why. If the Vipukirves LeverAxe doesn’t interest you, maybe one of these will. Can be safely used indoors. Clean energy and ultra portable. 2 HP, electric motor will work in a typical house socket. Affordable, quiet and safe to use indoors. No fumes. Built-in log cradle/guide keeps logs on track. Portable log splitter with comfortable grip handles and 6″ tires. CSA approved with a two-year WEN warranty. ✓ View or download the MANUAL for the WEN 56206. You can always count on WEN to deliver reliable power tools, and their 56206 electric log splitter is no exception. Even though it’s a very lightweight and inexpensive piece of machinery, it still handles logs up to 10 inches in diameter and 20.5 inches in length rather easily. They’ve even built in a cradle to help guide the logs towards the blade ensuring a perfect cut every time. It’s also known for lasting a long time before something goes wrong, which is great if you use it regularly. It does lack power because it runs on electricity, but this also offers you a few advantages too. For example, it’s always going to start when you want to switch it on, unlike gas-powered motors which are affected by the cold weather. It hardly makes any noise when it’s switched on, which is another good reason why it’s fine to use electric log splitters indoors. If you do want to move it outside it’s got a couple of large 6 inch wheels and very comfortable handles. 7 tons of splitting force. Automatic ram return. 7 tons of splitting force. 3,500 PSI hydraulic pressure. Will split logs up to: 20.5″ in length; and 10″ in diameter. Requires a 15 amp circuit; plug it in to a standard 3 prong household outlet. Strong tube log trays / legs. ✓ View or download the MANUAL for the Boss ES7T20. The Boss Industrial ES7T20 is similar to the last log splitter we looked at, but it does have a few more advanced features. This particular model is easy to use with one hand, so you’ll always have another one spare. Part of the reason this is possible is down to the professional-grade hydraulic system built into the machine, which will easily push your logs into the blade. There is also an automatic ram return to take over even more of the work from you. If you read the instruction manual it will tell you it can handle logs 10 inches in diameter and 20.5 inches in length, but current users have claimed it’s able to deal with logs a bit bigger and the company have decided to err on the side of caution with their claims. 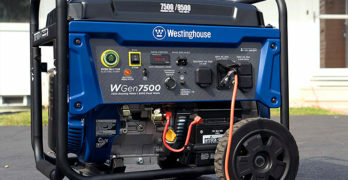 It has a similar 2 HP electric motor like the WEN 56206, and it can also magically start with a quick push of a button. The log splitter will have no problems starting in cold weather too, so you’ll always be able to stay warm. Excellent value. Has cycle time of 10.9 seconds — down and back. 22-Ton gas log splitter with 6.5 HP 196 cc kohler engine. 4 in. diameter cylinder with 24″ stroke. 2 in. ball with safety chains DOT approved 16″ Tires. 8 in. foot plate and removable stripper plates. The Dirty Hand Tools 100171 is a different animal altogether, and the biggest difference is the fact it’s gas-powered. It’s much more powerful than the models we’ve looked at so far, which isn’t hard to imagine when you realize it has a 6.5 HP 196cc Kohler engine. It takes a little over 10 seconds to move towards the blade and return back, plus it’s able to handle logs whether they’re sitting horizontally or vertically. As a bonus it will catch all the cut logs for you. It’s more than capable of handling logs more than 30 inches in diameter because it’s so powerful and uses a special 4-way blade. This model does weigh almost 600 pounds, so it’s not the kind of log splitter every single person will need. If you do need a huge monster to handle the large amount of logs you have to deal with it’s exceptional. Just remember you’re going to need something to tow it around, and because it’s gas-powered you’ll have to use it outside. Made in the USA! 28-Tons of force. Horizontal & Vertical Splitting. 8.75 Gross Torque Briggs & Stratton Engine. 28 Ton Horizontal & Vertical Splitting Positions provides ample splitting force for all wood species. View or download the MANUAL for the Swisher LSRB87528. Are You Ready To Test Out The Greatest Axe Ever? The Vipukirves LeverAxe is without a doubt the best axe on the market at the moment. It’s hard to believe someone could have improved a basic tool we’ve been using forever so much. If you use regular axes at the moment you should ignore them completely, because the LeverAxe doesn’t work in the same way and you need to test it out to see what it’s all about. On the other hand, you might finally be ready to say goodbye to axes altogether. The cost of log splitters finally means you can make a sensible choice without worrying about money. It’s a tough call you’ll have to make, so it might be a good idea to research your favorite products we’ve looked at today in more detail to help you come to a final decision.